Heart health is the focus this year as we celebrate American Heart Month. 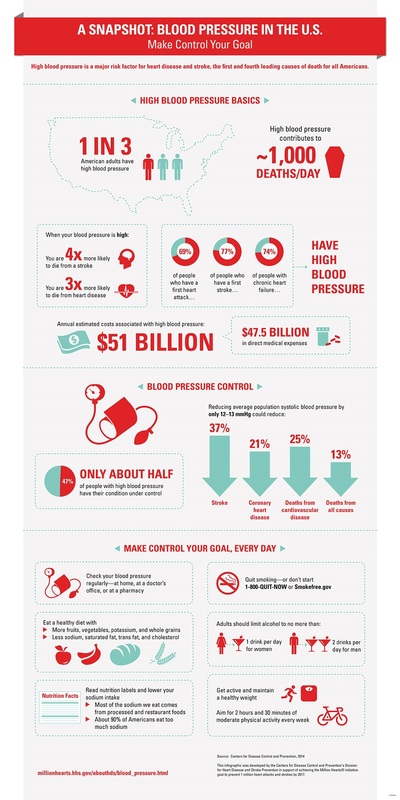 The Centers for Disease Control and Prevention (CDC) and Million Hearts® – a national effort to prevent one million heart attacks and strokes in the United States by 2017 – are encouraging Americans to know their blood pressure, and if it’s high, to make control their goal. Uncontrolled high blood pressure is a leading cause of heart disease and stroke. In fact, more than 67 million Americans have high blood pressure. People with high blood pressure are four times more likely to die from a stroke and three times more likely to die from heart disease, compared to those with normal blood pressure. • Ask your doctor what your blood pressure should be. Set a goal to lower your pressure with your doctor and talk about how you can reach your goal. Work with your health care team to make sure you meet that goal. Track your blood pressure over time. • Take your blood pressure medicine as directed. Set a timer on your phone to remember to take your medicine at the same time each day. If you are having trouble taking your medicines on time or paying for your medicines, or if you are having side effects, ask your doctor for help. • Quit smoking — and if you don’t smoke, don’t start. You can find tips and resources at CDC’s Smoking and Tobacco website. • Reduce sodium intake. Most Americans consume too much sodium, which can raise blood pressure. Read about ways to reduce your sodium and visit the Million Hearts® Healthy Eating & Lifestyle Resource Center for heart-healthy, lower-sodium recipes, meal plans, and helpful articles.